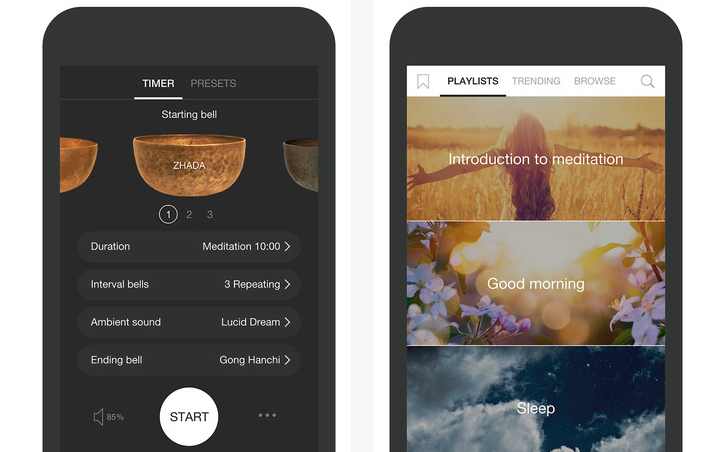 Insight Timer is a meditation app with a large selection of audio tracks to choose from, including guided meditations, music, and talks by teachers. Users can join the community of users, which includes chat groups focused on specific issues (e.g. “Beginner’s Mind”, “Women Meditate Worldwide”). Users can also see the activity of other nearby users (e.g. which tracks they have listened to) and follow how many people are using the program around the world. In addition, the app enables users to track personal progress, switch easily between many different languages, and make use of the meditation timer with background sounds. Insight Timer is a good meditation app that is most suitable for users who have some experience in meditation and know what kinds of meditation they prefer to practice. Its large selection of content offers users a diverse experience. The tracks are of good quality and the content is professionally delivered. The community features contribute to a sense of togetherness while using the program. However, for the beginner meditator, the selection could be confusing, and the program could use some more categorization to assist users in finding the most appropriate tracks. Insight Timer could be recommended to patients who are dealing with mood or anxiety difficulties and who use a combination of meditation and relaxation techniques in therapy. As described, the program offers a large library of meditation tracks and therefore could be best used if the therapist reviews the different options and instructs the patient as to which track to use and when.